International grooming, styling and personal care products specialist Wahl UK presented their Charity of the Year, Pilgrims Hospices, with an amazing fundraising cheque for £6,079.44 recently. Wahl also headline sponsored Pilgrims charity fun run, Santas on the Run! In 2018 and entered over 30 members of staff into the fun. 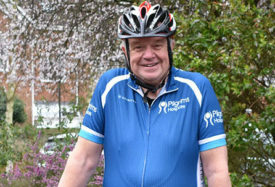 “We are very proud to have supported this event. Santas on the Run was a fantastic, fun way to end the year.” Mr. Goodman told us. Wahl organised a range of fundraising activities in the office for Halloween & Christmas, a member of staff made a skydive and they donated boxes upon boxes of toys and clothes to Pilgrims Hospices retail shops. The charity team also organised a quiz night for staff, family and friends. The quiz night was a great success with it being their most successful quiz night to date! The company match-funded the money raised by the charity team in the office fundraising and they also generously match-funded the sponsorship raised from Santas on the Run! I had no idea they had achieved such a huge sum, it was a brilliant surprise! The team kept their fundraising total a secret during the year, it wasn’t until they handed Lydia Todd, Pilgrims Fundraising Officer the cheque that the amazing total was revealed. Lydia said: “I had no idea they had achieved such a huge sum, it was a brilliant surprise! 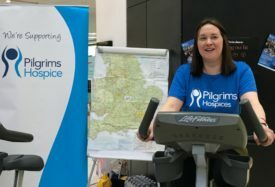 Find out more about fundraising for Pilgrims Hospices by contacting your local Pilgrims fundraising team for help and advise on how to get involved fundraising@pilgrimshospice.org. Each year Pilgrims Hospices give care and comfort to over 2,300 people in East Kent coming to terms with an illness that sadly cannot be cured. The charity support patients to live life as well as possible until the very end, free from pain and distress.